Thursday, June 6, 2019 | 3:30-6 p.m. Following brief remarks and a ribbon-cutting by library and city officials, the afternoon will be filled with refreshments, music and entertainment. Plus, all are welcome to explore the new branch (see rendering below), whether on their own or as part of staff-guided tours. Visitors can also sign up for a commemorative library card and register for a chance to win an eReader. The temporary Dublin Branch located at 6765 Dublin Center Dr. remains opens to customers. Its closing date will be shared in the coming months. The former Dublin Branch, built in 1980 and renovated in 1990, was one of the most heavily used branches in CML’s 23-location system. 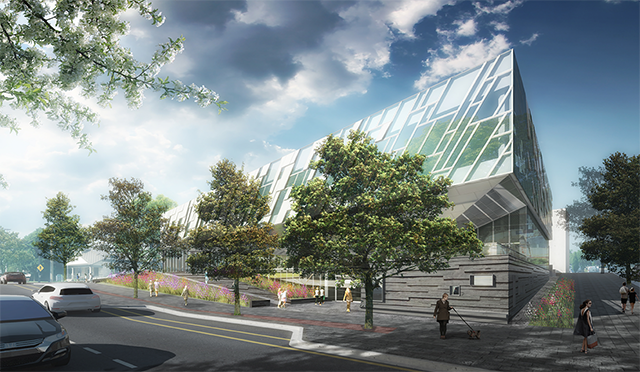 The new three-level Dublin Branch, being built on the same site, will double the size of the former branch from roughly 20,100 square feet to approximately 41,000 square feet. Additionally, an adjacent 4-level parking garage is being constructed by the City of Dublin with 200 spaces reserved for branch customers. Turner is the construction manager at risk and NBBJ is the architect.